(Ft. Lauderdale, FL) – Broward Sheriff Al Lamberti swears in 17 firefighter/paramedic recruits at the Public Safety Building on January 23rd. Class # 08-01 successfully completed 14 weeks of intensive firefighter training at the Broward Fire Academy, under the direction of the Broward Sheriff Fire Rescue training division. The new employees received their badges from Sheriff Lamberti and Chief of Department Joseph R. Lello. The BSFR honor guard was joined by the Black Pearl Pipe & Drum Corps at the traditional badge pinning ceremony. (Broward County, FL) – Broward Sheriff Fire Rescue Chief of Department Joseph R. Lello (right) congratulates Fire Marshal and Deputy Chief Charlie Raiken (left), who received the 2008 Leadership Award from the Fire Chief’s Association of Broward County at their annual recognition ceremony on December 4th. Chief Raiken was recognized for his planning, communicating the need for, and obtaining support and funding for the FCABC’s Juvenile Firesetters Prevention and Intervention Program. Chief Raiken, a familiar face in Florida’s Fire Service, will mark his 30th year of service in April. On Thursday, October 23, hundreds of BSO employees gathered for a service to honor the memories of Deputy Tony Yanniello and Battalion Chief Richard Korte. Dep. Yanniello was killed in the line of duty on October 18, 1984, after responding to a domestic violence call. “It is ironic that October is National Domestic Awareness Month, the same month Dep. Yanniello lost his life helping a victim of this tragic crime. We do more to assist the victims of domestic violence than we did back then, but for law enforcement, responding to these types of calls is just as dangerous,” Sheriff Al Lamberti remarked during the service. Battalion Chief Richard Korte died on October 3, 1999, after a long battle with lung cancer. Battalion Chief Korte served the Broward community through his work in fire service for almost 30 years. He was an expert in his field and is responsible for the development of numerous fire codes in effect today in Broward County. “Chief Korte’s love of fire rescue came only second to the love of his family,” said Chaplain Rick Braswell. 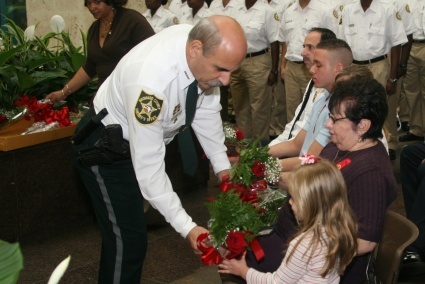 Photo caption: Sheriff Al Lamberti presents the family of Battalion Chief Richard Korte with a symbolic rose to honor his memory during the memorial service.